This case study of excellence presents how museums, memorials, and cultural heritage institutions running on a limited budget can develop a virtual panoramic tour with basic functionalities like navigation, zooming, information hotspots, and integrated links to websites, online databases, platforms, etc. As a ViMM best-practice example serves the project Bode 360° – A virtual tour of the Berlin Bode-Museum planned and realized by Wolfgang Gülcker. A presentation of the main components and services of Bode 360°, a sketch of how to create a virtual panoramic tour, and a brief look at future possibilities are the central topics of this paper. In the published tour 260 links connect neighboring panoramas. Moreover, 850 artworks can be admired on the tour of the Bode-Museum. To provide users with additional information to the artworks and links to the external online database SMB-Digital → http://www.smb-digital.de/ 850 object-hotspots were integrated. In the course of roughly one year Wolfgang Gülcker, a German software developer, photographer, art enthusiast, and member of the Freundeskreis Kaiser Friedrich-Museums-Verein (Kaiser Friedrich-Museum Association) in collaboration with the public relations department of the Staatliche Museen zu Berlin (State Museums of Berlin) put his idea of a panoramic museum tour for mobile devices and desktop computers into practice. Bode 360° can also be seen as an excellent example for small- and medium-sized museums and memory institutions wishing to implement a virtual panoramic tour with only little resources at hand, which is why it was chosen to be presented as a ViMM best-practice example. At home on their desktop computers or on the go on their smartphones and tablets users can explore the Berlin Bode-Museum, walk from one room to the next, look at over 850 sculptures and paintings, and learn more about the artworks by clicking on the small infobuttons. Half of the objects showcased in the panoramic tour are also linked to SMB-Digital, the online database of the Staatliche Museen zu Berlin (State Museums of Berlin) where users can find detailed object information and further images. In each room users are served with a list of highlight objects to explore and a short text about the history and concept of the room they are in. To start Bode 360° on a mobile device users simply have to open a browser and load the website → http://bode360.smb.museum/. They do not need to download and install a program or app on their smart device. Navigating through the website is fairly easy and self-explanatory. On the bottom of the page a slim navigation bar with icons provide a range of services, for instance a drop-down menu with useful functionalities like help videos and FAQs, a menu for settings, a share button for the most common social media channels, a language switch (German and English), a button that allows showing or hiding hotspots, a zooming tool, a full-screen button, a navigation-cursor icon, a help icon, and an info button opening a pop-up window with the list of highlight objects and additional information about the current room. 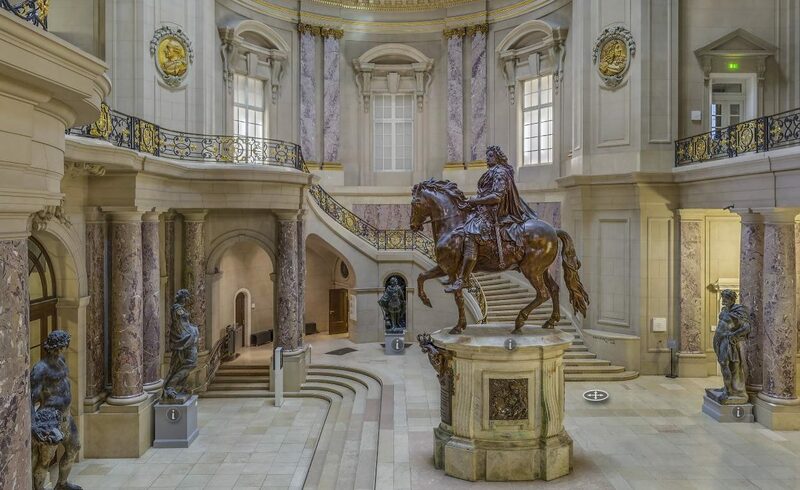 Users who already know which room of the BodeMuseum they want to visit have the option to open either a list of rooms or a floor plan of the museum which allows them to jump to the desired room with a few clicks. It is possible also to hide the icon bar and navigate through the website by the help of the mouse only. (3) designing the user-interface and programming interactive functionalities. Bode 360° is a learning-by-doing project that required a lot of research and tailored solutions. For example a metadata structure had to be developed that works efficiently with the interactive functionalities over the web. As a result the data (panorama and metadata [tasks 1 and 2]) is separated from the runtime code . To add a new panorama to the tour, a new XML file describing the panorama had to be created. Here the following items were defined in a structured way: the room text, the object data, the information about the panorama photo, and lists of hotspot links to objects and neighboring panoramas. When this XML file is referenced in a central configuration file the new panorama becomes part of the tour. This architecture can easily be adapted to other projects: the work consists mainly of steps  and  plus integrating panoramas and metadata into a central configuration file. Currently, virtual reality applications for the enhancement of panoramas and other 3D-based presentations are under development. For Bode 360° such a virtual reality application with integrated information and navigation points is in a testing phase → http://guelcker.de/pano/proj/bodemuseum-vr/. In the future it will be even possible to enjoy the virtual tour of the Bode-Museum with virtual reality glasses. Prospectively, high-definition panoramas and virtual reality surroundings can further enrich the presentation, allowing users to zoom into the artworks (up to giga pixel images) and marvel even the tiniest details. The implementation of 3D objects – for instance three dimensional scans of sculptures and statues – into virtual panorama tours is a further possibility to bring the virtual museum experience to a new level. Due to the openness of the visualization software it will be technically feasible to integrate future web-based apps. Panoramas and virtual tours can be an attractive application affordable also for small- and medium-sized museums and cultural heritage institutions running on a comparatively small budget. Although the technology behind virtual panoramic tours might not be considered as cutting-edge anymore, the example of Bode 360° demonstrates that feasible, good-quality, and low-cost alternatives to high-end, high-priced solutions are available. With a minimum of technical photo equipment, some programming skills and creativity cultural heritage institutions are able to copy this ViMM best-practice example. Virtual museum tours are a great means to spark curiosity, reach new audiences and present the museum/ memorial on the internet in an innovative way. Ultimately, virtual panoramic tours and the software behind them, give museums the freedom to experiment with digital content, showcase content in a novel way – and overtime – further develop and enhance their presentations. Bode 360° | Virtuelle Tour durchs Bode-Museum, online presentation of the Staatliche Museen zu Berlin, http://bode360.smb.museum/, (as of May 2017). Bode 360° | Virtual Reality version of the tour, official website of Wolfgang Gülcker, http://guelcker.de/pano/proj/bodemuseum-vr/, (as of May 2017). Virtual tour of the Bode-Museum opens to public, press release of the Staatliche Museen zu Berlin, http://www.smb.museum/en/whats-new/detail/virtueller-rundgang-durch-das-bode-museum-freigeschaltet.html, 21.12.2015 (as of May 2017).